In this groundbreaking book in the dim world of opinion formation Helm­reich opens a closet bursting with skeletons and explores the myths and his­torical roots of stereotypes pertaining to several ethnic groups: Are Jews re­ally smarter? What about rhythmical Blacks, hard-drinking Irishmen, dumb Poles, emotional Hispanics, and all those cold, artificial WASPs sipping in­evitable dry martinis? 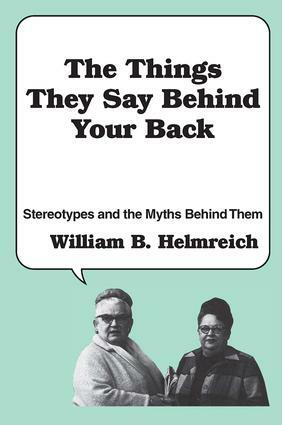 He discusses which stereotypes are false, which are true, how they originated, and why some of the most libeled groups pro­mote warped perceptions about themselves.Helmreich has examined over four hundred scientific studies and com­bines hard facts with humor, anecdotes, and common sense in his courage­ous attempt to understand and explain stereotypes. He contends that we should discuss this topic openly and recognize the tendencies and traits, negative and positive,-that are rooted in a group's history and culture rather than pretend that there are no differences among the members of multiracial America.